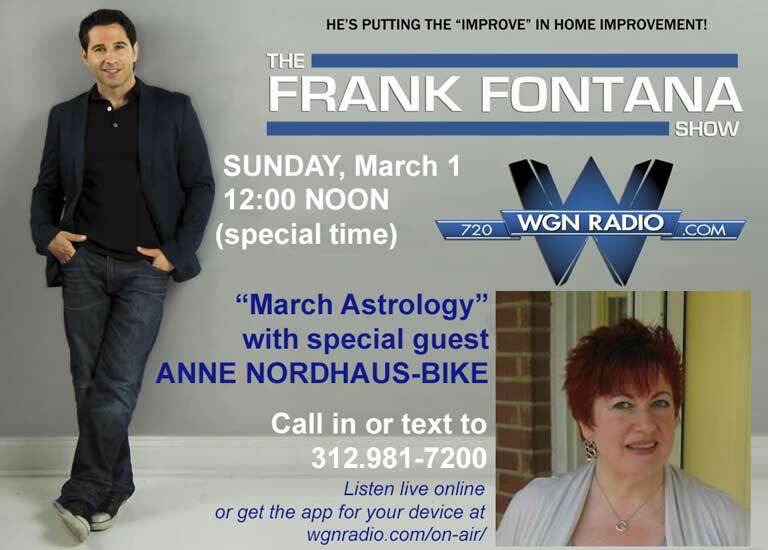 Anne returned to the Frank Fontana Show on WGN Radio yesterday to talk about the major astrology that’s coming later this month and in early April. Her spring astrology podcast from the show is now up on the WGN Radio website. Throughout the program, she and host Frank Fontana discussed why this time of year is so powerful and how to use its energies to improve our lives. They also took many calls and texts from listeners and shared simple ideas for overcoming stressful times and welcoming in better times. March 2015 will be even more powerful than usual, however. “Since 2012, we’ve been forced to adapt and change because of the ongoing series of tough alignments between the outer planets Uranus and Pluto,” said Anne. “The last of seven alignments happens this month, on March 16, so the energies will be very high as we lead up to that time.” For more on Uranus square Pluto, see the complete series on this major astrology here: Uranus Square Pluto. Once again, callers jammed the lines and sent in numerous texts during the show. While talking with callers and answering texts, Anne talked about current planetary placements and key dates when planets—and energies—will shift. Also, she and Frank shared several ideas with listeners about the power of thought and how to shift from difficult energies to a more positive and hopeful life.